In the far reaches of time (2000 A.D), Venice is a polluted hellhole. Something below ground is turning men into monsters. A group of the worst most unprofessional soldiers ever put on film and a strangely blank faced representative from the Tubular Corporation (no, really), head below ground to search for one, Dr. Rafelson, who claims that he knows what’s happening. After running around like idiots for a while they finally discover a little girl and Rafelson’s lab. The good Doctor has created an enzyme that turns people into monsters. It all goes wrong, people get killed, and one guy happens to be a cyborg in disguise… I’m sure you were as shocked as I was. Terminator II is astounding in that it not only steals plot points but whole paragraphs of dialogue from Aliens (1986), and then turns around and manages to shoehorn in a cross between the Terminator and Ashe from Alien (1979). It could almost be viewed as a clever bit of mash-up and remix, well before this was a common element of film making. I say almost because every element of this movie is ham-fisted, cheap, and poorly made. I suppose if there is a platonic ideal of Italian rip-off movies, this would be it. Terminator II is so hell-bent on stealing from other movies, that it does so at the cost of any narrative consistency. Characters regularly spout lines of dialogue that make no sense at the time, and exist solely because they were in another film. Plot points occur, not because it’s an interesting turn of events, or a natural outcome of a situation, but because that scene where all the Marines are watching in horror as the blips on their motion trackers get closer looked really cool. The acting is terrible across the board, whether this is due to the disconnection between dialogue, the actor, and the dubbing, or the fact the script gives nobody involved a thing to work with, is difficult to say. I’m sure it’s a mysterious combination of both that coalesces into something this potently awful. Special notice should go to Clive Riche as the psychotic Drake, who somehow overacts and fails to emote in equal measures. Newt… excuse me, Samantha (Dominca Coulson) hits a constant tone of whining that will have you begging for a mutant to do her in. This film was directed by Bruno Matei, the man who brought us such joy as: Hell of the Living Dead (1980), Rats: Night of Terror (1984), and Strike Commando (1987). There's not a single one of these films I can qualify as good, but they do manage to entertain in cheap, laughable kind of way. Shocking Dark fits right in his oeuvre; his combination of audacity and incompetence is far more entertaining than anything happening with the story itself. 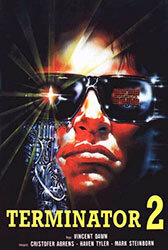 It’s wondrous for Terminator II to have been allowed to exist at all, this film would be an impossibility today with such rabid protection of ‘intellectual property.’ So, I suppose if you have to admire it for anything, that’s about as good as it’s going to get.